Captions unavailable... please check back. When Henry Calamity was a boy, even the sagebrush was different. It grew as big as trees, said the octogenarian. The leaves were bigger than they are today, and smelled so sweet when you crushed them. Back then, said Calamity, who spent nearly three decades as a chapter official, the rains came predictably and watered the crops of corn, squash, melons and beans. You could find water in little pools and seeps. There was no need for windmills. Today, the people of Ts'ah bii Kin Chapter have some of the best views on the reservation, down into the canyons and up to Black Mesa, White Mesa, Square Butte and Navajo Mountain. But when today's elders were small, everyone lived in the canyons that streak this stunningly beautiful chapter like blood-red veins. "The canyons were our lifeblood," said Roy Tate, 78. "That's where the water was." Tate worked for the Santa Fe Railroad "between lifetimes," as he puts it. But in his heart, like most all of the elders here, he has always been a farmer. "When I got retired," he said, "I went back to the fields." Today, Tate's fields are a short walk from his home on the canyon rim. He and his wife Susie, 72, have a view into Jones Canyon of the type you'd have to be a millionaire to own in Flagstaff. But they, like Calamity, wax nostalgic for their youth in the canyon, fetching water from the To Han'lhooshi (Bubbling Springs) and living off their crops and the land. It wasn't paradise, Susie reminded her husband ... she remembers the swarms of flies that would come in the fall when the people hung strips of meat out to dry for the winter. But people were happy and healthy -- "We didn't have bad stuff, like soda pop" -- and families helped each other. One reason the canyons were the choice property then was because they felt safe, said Calamity, speaking in Navajo with his granddaughter translating. They had hidden the people from the U.S. cavalry during the Long Walk. Calamity's great-grandfather was Daghaa Sikaad, a renowned Zuni medicine man who led his Navajo family into the canyons to escape the soldiers. Using both his wits and some strong Zuni medicine, the man known in English as "Many Whiskers" was able to escape the U.S. Army again and again. The soldiers had their own name for him: "Calamity," as that is what seemed to befall them any time they chased Many Whiskers or his sons. The name has stuck as an intriguing surname to this day. In addition to the canyons, Roy Tate said, the Navajos have the Paiutes to thank for their escape. "There were a lot of them living in the area," he said. "Our grandmas and grandpas went and lived among them. When the soldiers would come through, the Paiutes said, 'Navajos? There's no Navajos here.'" So many people from this area escaped the Long Walk that there are few stories told here of that dark era in Diné history, Roy Tate said. It wasn't until a few years ago, reading a plaque in a museum, that it hit home with Roy just how hard the forced migration was on his tribe. "It's a sad story," he said. Name - Until 2007, this chapter was known as Inscription House, after a beautifully preserved Anasazi ruin with a much later inscription: "Shapeiro Ano Dom (Year of our Lord) 1661," presumably left by a Spanish missionary or explorer. Because of erosion and vandalism, Inscription House has been closed to the public since 1968. 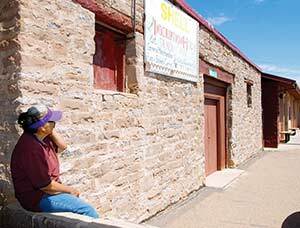 The chapter's present Navajo name, Ts'ah bii Kin, or "House in the Sagebrush," refers to the old stone trading post you can still see next to one of the chapter's two convenience stores. From a distance, said local elder Henry Calamity, it looked like the store was inside a huge sagebrush bush. In fact, horrible as it was, the Long Walk was a bit serendipitous for these Diné of the far west. "That was when we first got sheep," said Calamity, explaining that flocks left behind by the captured Navajos to the east eventually made their way here. They multiplied rapidly in the fertile canyons, and by the time of the Livestock Reduction in the 1930s, the people of Ts'ah bii Kin were so dependent on their vast ovine herds that some families nearly starved when deprived of them. "Those were hard times," Calamity recalled. "People went hungry." One by one, the families of the canyons moved up to the rim, collecting wood to trade at the newly built stone trading post that you can still see today as a defunct laundry next to one of the chapter's two convenience stores. A school was built in nearby Shonto, and then a clinic here, and wells with windmills, and soon there was little tying the people to the canyons except nostalgia, Susie said. 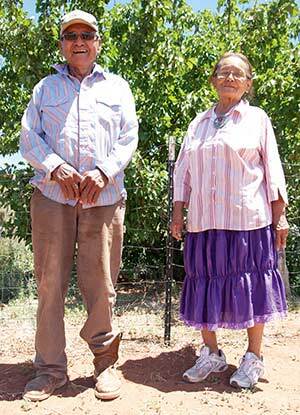 But if you hike into Jones Canyon in the fall, your may still find the apple trees her father, Council Delegate Paul A. Begay, brought to the area as seedlings, and pick some apples that are still as big and juicy as Susie remembers them as a girl. Today, Ts'ah bii Kin is still moving on up, but it's a figurative progression. The hiring of a new community services coordinator, Earl Sombrero, in February or March has brought new excitement and vision to this isolated and traditional land, according to chapter employees. Goals include bringing electricity to the 75 families who have asked for it, as well as a solid waste transfer station complete with recycling. The chapter has revitalized its community emergency response team and has joined forces with Coconino and Navajo counties to put on a comprehensive disaster preparedness conference at Twin Arrows Navajo Casino Resort at the end of this month. It's looking at restoring the network of earthen dams that used to prevent erosion of its sandy, red soil, and working with the Navajo Housing Authority to plan "clan pods" -- cluster housing where all the tenants would be from the same clan or family, similar to how Navajos have traditionally chosen to live. Rural addressing and a nice multi-purpose building are also on the list. Perhaps even more importantly, the chapter is working hard at building community by hosting events. The recent Intergenerational Conference brought youth and elders together for a fun walk, horseback ride and activities such as rug weaving, making Navajo tea and cooking sweet tamales. Other events have included a resume-writing seminar and college/career day, during which locals pursuing interesting degrees or careers were invited to come back and talk to the youth about what they're doing. The chapter is also looking into the possibility of converting the Inscription House Clinic to a PL '638 facility over which a local board of directors would have control. Ts'ah bii Kin once drew adventurous tourists because of the beautiful Inscription House Anasazi ruin, part of Navajo National Monument. But that attraction has been closed to the public since 1968 to prevent degradation of the delicate structure. Still, Ts'ah bii Kin's incredible canyons could definitely be a mecca for hikers, and the chapter is anxiously watching the plans for paving the road between Oljato and Monument Valley, which could route more tourists its way. And amid all the bustle, Ts'ah bii Kin's agrarian roots may be sprouting new shoots. When the Times visited last week, four teens from a Tuba city youth group were sweating in their T-shirts and tight jeans, planting a demonstration garden behind the chapter house. It's too bad Calamity and the Tates weren't there to see it. It would have done their hearts good.